Got shampoo? Help us welcome 80 new refugees this month! Thank you for your support of Refugee Services at the Minnesota Council of Churches. We have news to share with you about new congregational relationships in the Twin Cities and an exciting feature from the Star Tribune. Please scroll down for information about urgently needed donations and join us in welcoming Ben Walen as our permanent Director of Refugee Services! Refugee Services Makes the News! "Katia Iverson and Abdirahman Abdullahi have 90 days together. A Somali family recently resettled by MCC was featured on the front page of the Star Tribune. 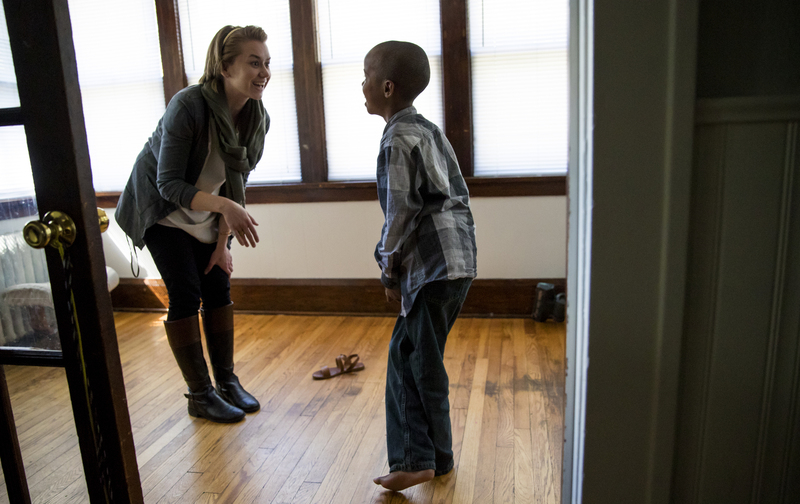 A reporter followed this family and Refugee Services Case Manager Katia Iverson for the family's first 3 months in Minnesota. We encourage you to read the whole article and share with friends--it offers a detailed and balanced picture of what life is like for many new refugees. For many families, summer is the time to relax and take it easy. The kids are off from school, and families plan vacations and time at the lake. But we know of at least one place where summer does not equal a slow down: refugee resettlement! We typically see many more new families arrive during the summer months, and that means that household items fly off the shelves as fast as we can stock them! Imagine (if you can) setting up house for 150 people between August and September, all of whom have only a couple of bags of personal belongings and clothing to start out with. That’s a lot of the basics—kitchen utensils, laundry supplies, dishes, toiletries, and the like! As always, donations can be delivered to the MN Church Center at 122 W Franklin Ave, Minneapolis. Please visit our donation page for updated guidelines and drop-off instructions. Call 612-230-3219 or email rsvolunteers@mnchurches.org with any questions. Tears in their eyes and note pads scribbled with information gleaned from the “Refugee 101” presentation, the women of the Faribault Church of Jesus Christ of Latter Day Saints Relief Society asked how they could help refugees in their town. With tables full of first aid kits, backpacks, and school supplies in the background, the women already were helping. They were answering the call put out by the First Presidency of The Church of Jesus Christ of Latter-day Saints in March 2016 to welcome the stranger. The call, entitled “I Was a Stranger” reminds the Mormon church of their history as refugees in 1839 when Mormons were violently driven out of Missouri and the citizens of Quincy, IL gave them a safe place to land. They provided shelter, provisions for food and clothing, and a chance to live a meaningful, safe life. The Mormon church has not forgotten that life-saving kindness. So far, Mormon congregations in Faribault, Oakdale, and Burnsville, MN as well as in Hudson, WI, have collected donations and hosted our “Refugee 101” presentation to educate their members on the refugee’s struggle from homeland to refugee camp and then to the Twin Cities. Additionally, a congregation in Anoka, MN hosted our Jump Start class for a group of Ukrainian families. We are thankful for this amazing support and generosity.